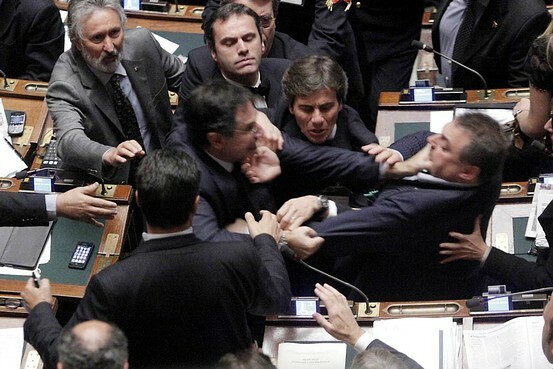 A fist fight broke out in the Italian Parliament today. Two Politicians started strangling each other before others rushed in to break it up. The parliamentary sitting was suspended for several minutes after the fight, which broke out because of sarcastic remarks on television by Fini alleging that the wife of League leader Umberto Bossi had retired at 39. Bossi has steadfastly refused to make more than slight concessions to Prime Minister Silvio Berlusconi on the League’s objections to changing Italy’s generous pension system as part of reforms demanded by European leaders.